Emerson EasyHeat® SR Trace™ Self-regulating heating cable of length 750-ft, produces heat output of 5-Watt/ft at surrounding temperature of 50 deg F. It automatically alters their heat output with the changes in surrounding temperature. It has voltage rating of 240-Volt AC. It regulates heat output with respect to change in surrounding temperature. Self-regulating feature of this cable allows you wrapping around themselves when installed on pipes, valves or flanges. 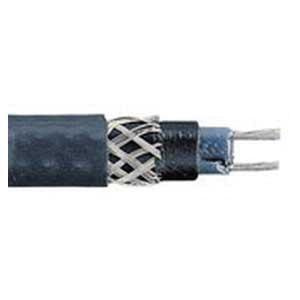 This cable features two size 18-AWG tinned copper conductors for better conductivity. Polyolefin jacket provides extra mechanical protection. It withstands temperature of up to 150 deg F. It is perfect to use in freeze protection and temperature maintenance of metal and non-metallic pipe and vessel surfaces in dry or damp ordinary locations. Heating cable is cULus listed. * Inventory displayed is accurate as of 04/24/2019 14:40 EDT.